President Donald Trump listens during a meeting of the President's National Council of the American Worker in the Roosevelt Room of the White House, Sept. 17, 2018, in Washington. 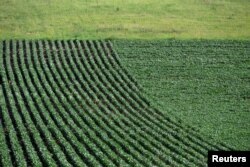 Farmers worry about falling crop prices and lost sales overseas. Manufacturers fear rising costs and new foreign taxes on their exports. American allies overseas are furious. By any conventional gauge, President Donald Trump's uncompromising stance toward tariffs and the pain they've begun to cause U.S. individuals and companies so close to midterm elections would seem politically reckless. Yet Trump appears to be betting that his combative actions will soon benefit the country and prove a political winner. Ditching decades of U.S. trade policy that he says swindled America and robbed its workers, Trump insists he can save U.S. jobs and factories by abandoning or rewriting trade deals, slapping taxes on imports and waging a brutal tariff war with China, America's biggest trading partner. "Prior presidents in both political parties have never really moved to try to help and protect the American economy and its workforce, its farmers, its manufacturing workers, in a way of creating a level playing field," Larry Kudlow, the top White House economic adviser, told reporters last week. "They give it lip service, and then they back off. This president has no intention of backing off. None. Zero." Trump's apparent belief is that he and congressional Republicans can rely on the unswerving support of core GOP voters — even in rural areas that have been economically hurt by his trade disputes — and maybe succeed in delivering better trade deals before Election Day. Still, as an insurance policy against failure, the administration is providing $12 billion in farm aid to soothe trade-war wounds in rural America. All told, it's a high-risk political gamble. "It's still unclear ultimately how the issue plays in November," said Nathan Gonzales, publisher of Inside Elections, a nonpartisan newsletter. The U.S. and China have imposed import taxes on $50 billion worth of each other's products in a rumble over American allegations that Beijing uses predatory tactics to acquire foreign trade secrets and to try to overtake America's global supremacy in high technology. Over the weekend, news reports indicated that the administration is set to announce tariffs on $200 billion more in Chinese imports — a step that that would significantly escalate the trade war between the world's two largest economies. Beijing has said it would swiftly retaliate against additional U.S. tariffs. Soybeans grow in a field outside Wyanet, Illinois, July 6, 2018. Caught in the crossfire are U.S. soybean farmers, a prime target of Beijing's retaliatory tariffs, whose exports to China account for about 60 percent of their overseas sales. These tariffs make U.S. soybeans prohibitively expensive in China. That means lost sales for American farmers. Separately Trump has enraged U.S. allies like Canada and the European Union by declaring their steel and aluminum a threat to America's national security as justification for slapping taxes on them. On yet another trade front, the president would raise the stakes considerably if he carries out a threat to tax $340 billion in imported cars, trucks and auto parts — action that would raise prices for vehicles Americans buy. What's more, Trump has threatened to kick Canada out of a North American trade bloc if it doesn't cave in to pressure to open its dairy market, among other things. Trump is running into resistance in pockets across the country. American farmers who rely on exports are facing retaliation from U.S. trading partners, which depresses export sales and prices of agricultural commodities. Manufacturers that buy steel and aluminum are being hurt by higher prices and supply shortages resulting from the tariffs on imported metals. Corporations fear that Trump's drive to rewrite the North American Free Trade Agreement will disrupt the supply chains that they've spent the past 24 years building across the United States, Canada and Mexico. If the trade war with China further escalates, consumers would face higher prices at the mall and online. The affected imports would range from handbags, luggage and textiles to a range of consumer electronics, including the Apple Watch and adapters, cables and chargers. On the basis of public opinion surveys, at least, the president's approach poses political risks. A poll released Aug. 24 by The Associated Press-NORC Center for Public Affairs Research found that 61 percent of Americans disapproved of the president's handling of trade negotiations. "The Trump administration has handed Democrats in the midterms at least a talking point, not just with farmers but with consumers," said Mickey Kantor, the top American trade negotiator under President Bill Clinton. Missouri's embattled Democratic senator, Claire McCaskill, is trying to link her Republican challenger, Trump ally Josh Hawley, to a nail manufacturing plant that says it might have to close because the Trump steel tariffs have driven up its costs. Likewise in North Dakota, Democratic Sen. Heidi Heitkamp is running ads tying her Republican challenger, Rep. Kevin Cramer, to Trump's "reckless trade war." Besides unveiling $12 billion in aid to farmers hurt by the conflicts, Trump is seeking to reach trade deals to show that his brass-knuckles approach will succeed in the end. He has said he expects to sign a deal with South Korea later this month during the United Nations General Assembly. Earlier this month, he announced an agreement with Mexico to replace NAFTA — a move intended to pressure Canada to embrace a new North American accord on terms favorable to the United States. Plans are underway for a delegation from China to resume trade discussions with the Trump team as early as this week. In addition, Trump says his team has started trade discussions with Japan and has received interest from India. For the president, the bet is that America's trading partners will capitulate promptly to his demands, rather than delay negotiations in the hope that Democrats will take control of the House and possibly the Senate and leave the president in a weaker bargaining position. "There is some pressure to get results," said Philip Levy, senior fellow at the Chicago Council on Global Affairs and a White House economist under President George W. Bush. "They need to do something where they can say, `Hey, this different approach actually works.'" Trump is also relying on the loyalty of his supporters in rural America. He has called farmers "patriots" who are willing to absorb economic pain in the short run to buy time for him to negotiate trade deals more advantageous to the United States. Approval for Trump's performance is still running at 53 percent in rural areas, compared with 39 percent overall, according to an NPR/Marist poll released last week. Even if they're worried about the trade disputes, many rural Americans support Trump's stands on social issues such as immigration — a sign that the president may have enough political leeway to drive forward with his hard line on trade. "Trump," said chief global strategist Greg Valliere of Horizon Investments, "has a lot of Teflon in the farm belt."